We want to bring complete transparency to household water and create a smart water quality database for infrastructure management. With technology five years in the making, Serene Sensors Inc (“Serene Sensors”) developed Water Shield to provide consumers with the transparency and education needed to protect themselves from harmful contaminants. Serene Sensors is a cleantech startup seeking to commercialize pioneering technology in the home water quality market. The company launched Water Shield today on Kickstarter with a CA$ 40,000 funding goal. Water Shield is a consumer-grade tap water analyzer. The product mounts under the sink and is fully operated by a mobile app while providing detailed readings on tap water chemistry. The device can report on 7 parameters: Lead (Pb), Cadmium (Cd), Arsenic (As), Copper (Cu), Mercury (Hg), Total dissolved solids (TDS), and Acidity (pH). Additionally, the water analyzer can be used with or without filtration systems. When used with filtration systems, Water Shield can accurately determine when to change a water filter or assess when it is no longer functioning optimally. The device reports on tap water chemistry in a routine, automated way. Water Shield takes the guesswork out of knowing if water is safe and healthy for consumption. The device also determines how one’s water compares to others in a neighborhood, city or state, lets the consumer know the right time to change their water filter, and also helps diagnose problems with on-premise and municipal plumbing. Water Shield can conduct regular, automated testing at home. The product provides the user peace of mind in knowing that their tap water chemistry is within the acceptable Environmental Protection Agency (EPA) and World Health Organization (WHO) guideline limits for safe consumption. If it is not, Water Shield will provide both long-term and short-term recommendations on how to fix an issue. Wi-Fi enabled and cloud connected, Water Shield is a smart device that will change the way water quality is managed by municipalities. Very little data exists about the consistency of water quality delivered to our homes, hospitals and schools. The Water Shield will enable the collection of data from end points throughout the city to create a dynamic database for citizens and local governments to work together in protecting our infrastructure. “We want to bring complete transparency to household water and create a smart water quality database for infrastructure management," said Hamed Jafari, Co-Founder and Chief Executive Officer. "Water Shield represents a paradigm shift in the household tap water monitoring market. The hardware is built around innovative technology developed by Serene Sensors and rigorously tested to meet health standards. With full-automation via a mobile app and accurate, efficient results, for the first time it gives consumers an affordable monitoring tool to protect themselves from water contaminants." Recently, there has been a lot of uncertainty surrounding the quality, taste, and safety of tap water in light of crises such as Flint, Michigan. Water Shield will help consumers manage their filtration devices more efficiently, serve as a detection system for water contamination, and after data is collected from various regions, help in the creation of a smart city management tool for water infrastructure. The Water Shield is currently available on Kickstarter starting at CA$ 75. To learn more, visit bit.ly/WaterSheildKS. 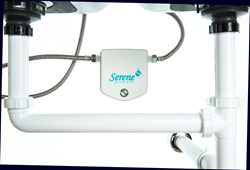 Headquartered in Toronto, Canada, Serene Sensors is on a passionate campaign to bring greater clarity to your tap water. With technology five years in the making, the company was founded with the purpose of providing meaningful and accessible water knowledge for everyone. To learn more, visit http://www.serenesensors.com.